The kids are on vacation this week because of the upcoming holiday. I've had time to enjoy them and just be a Mom. We had a busy weekend so at one point on Saturday afternoon I kind of crashed and fell asleep (such a rare occasion when I can do that). My husband was around the house with the kids so I think subconsciously I just felt like I could drift off. I was slightly awakened at one point because my two little ones were covering me with a blanket and giving me kisses on the forehead. They were tucking me in! How's that for an 'awww' moment. I'm so very grateful for all of you that have left such encouraging comments regarding my tags series. Wow! I really didn't expect all that. I also noticed some mentions of my work last week... here, here, here, and here. I can't tell you how gratifying it is to know that my work is appreciated and enjoyed by others. Really, truly, - thank you. Last week Danielle de Lange of Style Files opened an online shop called Le Souk. I designed her new logo, business cards and thank you cards. Danielle asked me to keep the project under wraps until she opened her shop so it's so nice to talk about it now. Among the many lovely things she has in her shop these are a few of my favorites: this stool, this lantern and this jug. Be sure and visit to see more of her wonderful finds. Danielle was such a pleasure to work with and I wish her the best! Over the weekend and out of the blue I received a couple of books from Princeton Architectural Press. I suppose they'd like me to review them but I don't know how much clout I have - if any. Regardless, it sure felt nice to receive them. I'm mentioning them because I truly did find them quite interesting. I had never heard of the first book - The Day-to-Day Life of Albert Hastings. It's a small, quiet, unpretentious but poignant book. It photographically narrates the daily life of Mr. Hastings who is a widower in his late 80's living in Wales. All photographs are by KayLynn Deveney. By the end, I had a lump in my throat and I was close to tears. It's not really a sad book per se but it just really touched me. Even my husband, who I read it with, had a similar reaction. I'd like to give someone else the opportunity to enjoy this book too (plus no more books fit in this house!) so if anyone is interested in it just send me an email with your address and I'll send it to you. --- EDIT - The book is on it's way to Australia. I've definitely heard of the second book but didn't really know much about it. It's The Guerilla Art Kit by the well known illustrator, Keri Smith. It certainly is sparking a lot of ideas. The book is described really well in the link I just provided above so feel free to read about it there. I'm still reading it - not in a sequential fashion for some reason. I keep going back and forth, back and forth. It's a great food-for-thought book. EDIT – I just posted a new interview on Crafty Synergy. Enjoy! I read a review about The Day to Day Life of Albert Hasting via Swissmiss I think. I saw the first few pictures and I was in tears. I have a soft spot for the elderly. I respect them so much. Your work is just beautiful and the exposure well deserved! They'll knock your socks off. Thanks Patricia, it has been a pleasure working with you! 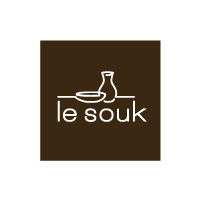 I am very happy with the beautiful logo you designed for Le Souk.